There are lot of apps, images, audio, video, temp files occupied large storage space on your device due to which you have to face hanging problem at your device. To avoid this situation you must have to know how to get more free storage space in Android phone. If you storage space cluttered up with unwanted apps or files then you have to face lot of issue. You must have to regularly free-up the space on Android device. Most of the person complain that large amount storage space occupied with unwanted app, images, audio, video or any other format files. In that situation they have to face lot of issues like battery drain problem, slow down Android performance, Hanging, Storage problems and other issues. Most of the Android phone users does not have microSD card facility in his phone. Due to low storage space they are not able to install new apps, click more photos, save more audio and videos. So, that they need to remove unwanted apps or old files from his system regularly. In this guide we have to discuss few most important and useful points which helps you to resolve the storage space and other kind of issue. If your storage space is too much low and face lot of issue then you must have to take following steps to free up storage space on Android phone. It is the best way after clearing the Cache of your smartphone you can easily increase internal memory of your smartphone. Most of the person don’t know how to clear the cache memory of your smartphone. To clear the cache memory of your smartphone tap on the Settings > Storage > Apps > tap on All option > Choose any App and tap on the clear cache or clear data option. After that all junk files and folder are removed from your device which occupied lot of space on internal memory of your smartphone. You can also use any third party app to clear the cash memory and data from your device like clean master app. You can use these third party apps to clear cache from your smartphone and these apps are available on free of cost on Google Play Store. This is another way which allows you to get more free storage space in Android Phone. If you device cluttered up with unwanted apps, images, different format files then you must have to move important files from phone memory to microSD card. The microSD Card have enough space to store all these apps and your internal memory is free which boost up your smartphone. If you want to move apps to SD card then tap on the Setting > Tap on the Manage Apps option > Select one or more apps which you want to move into SD Card > Now, tape on the Move to SD Card option. After that all apps transfer from internal memory to SD Card and this trick increase internal memory of your smartphone. There are few apps which are connected to registry file and these are not moved from phone memory to microSD card. Most of the person have large amount of personal and other photograph’s which occupied lot of space on your phone memory. If you don’t have microSD facility at your device and your storage space is full then there is no need to remove old images. You can easily transfer all important and personal images on Google Photos. Google allows his users to use up to 15GB free cloud space to store your important data. You can also use automatic backup feature on Google Photos to keep safe your images. It is another useful way to get more free storage space in Android Phone. Most of the person have to use lot of apps which occupied much more space at your device. If you don’t have enough space at your device and also facing hanging problem then you must have to use light version of apps. You can use updated and latest lite version of your favourite app which not only take small space but also increase the phone performance. You can easily download and install latest updated version of your favourite apps lite version from Google Play Store. Most of the time lots of user have large amount of different format files, images, audio or videos. These not only reduce storage space capacity but also reduce speed of your smartphone. To overcome this problem you must have to use cloud storage feature like Dropbox, SkyDrive and Google Drive at your device. The Cloud storage facility is used to store large documents, images, audio, videos and other things which is important for you. This is one of the great way to increase internal memory of your smartphone which boost up your smartphone. If you store your important files, images and other things in separate folder at cloud storage. Now you can easily recover or share the data at your smartphone. You can easily access cloud storage files from your computer, laptop or smartphone. Most of the person have large amount of heavy junk files and unwanted apps. These not only occupied lot of space at your device but also reduce the phone performance and face other issues. If phone memory full with unwanted files then remove them to get extra space at your device. You have to open your file manager in which you have lot of folders. If any folder does not important for you then remove them from your device. You have another best choice to to use external disk or drive. Transfer heavy files or folders in to external disk or drive. You can use wireless hard drive to get the solution for same issue. If you have heavy files then you must have to use Wi-Fi to transfer these file. 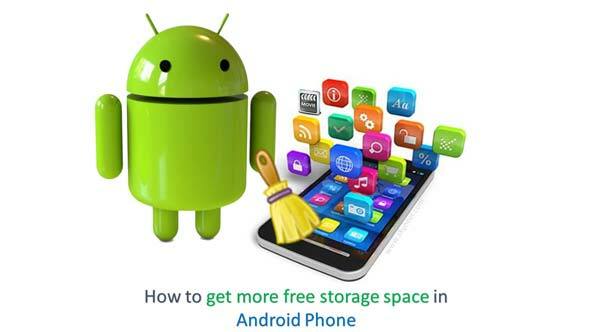 I hope after reading this guide you can easily get more free space at Android phone. If you have any suggestion regarding this article then please write us in the comment box. Thanks to all.